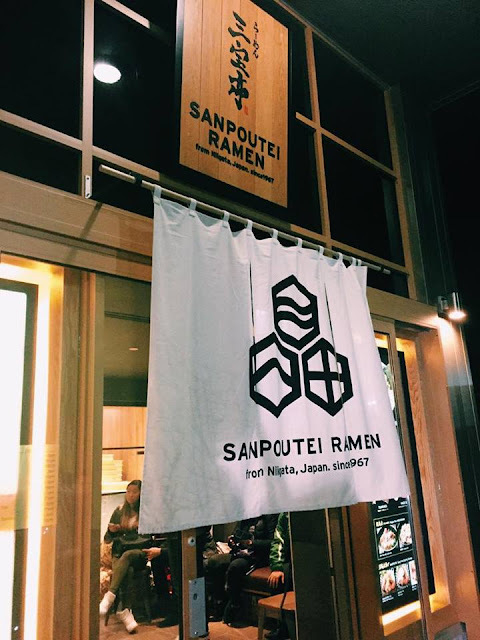 Sanpoutei Ramen opened up a few weeks ago and has been the talk of the town. 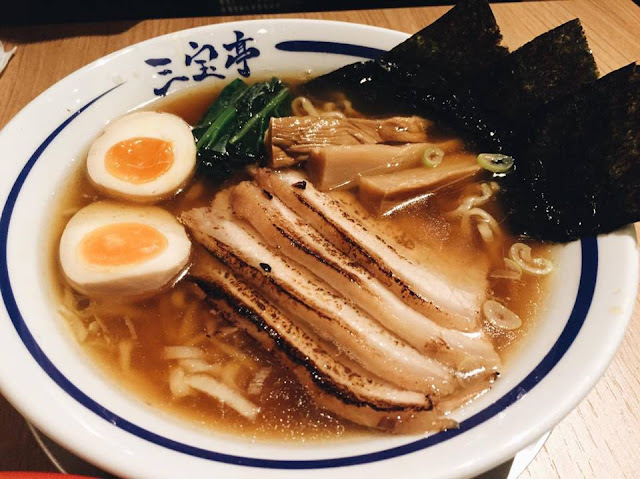 Located just between Parker Place and Aberdeen in the new Kam Do Square, they feature Niigata style ramen. They have been having crazy line ups for the past few weeks so I would suggest trying them once the hype has died down if you don’t want to wait. We went on a Friday night around 6pm and luckily only waited around 15 minutes. 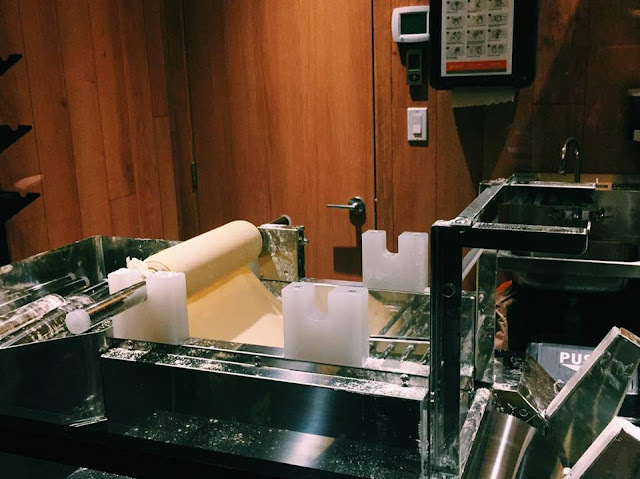 In the waiting area, you will find their ramen noodle maker. They make their noodles in house whereas many other ramen shops purchase their noodles. I think the biggest differentiation of Sanpoutei is how nice and spacious the interior is. 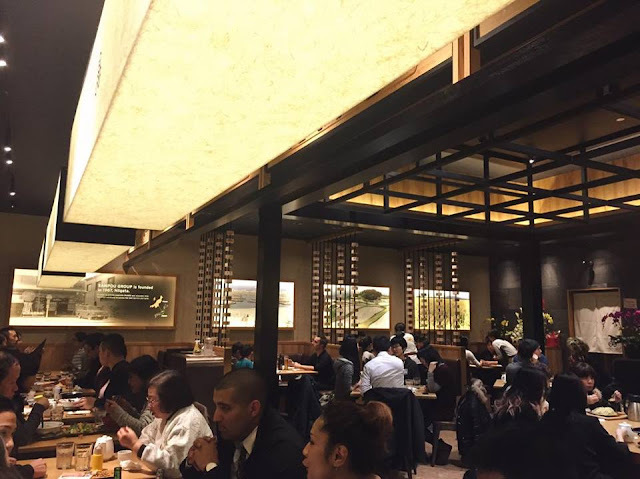 Decor is beautiful and you don’t need to be cramped with bar seating in front of a steamy kitchen like many other ramen shops. I got the Tori x Miso Spicy Ramen which comes with 2 slices of aburi chashu, half a flavoured soft-boiled egg, stir-fried vegetables and minced chicken for $13. Unfortunately, I think my bowl missed the egg. Their spicy broth is much thicker than the others. The noodles really soaked up the broth so I was left with very little at the end. However, I liked the broth as it had just the right amount of spice level without covering the miso flavour. The noodles are a flat wide wavy type and very different from the usual. If you like chewy noodles, this is perfect for you. I quite liked this change from the usual. S went all out and got the Niigata Shoyu Ramen with Special Full Topping for $14.50. This comes with 4 slices of aburi chashu, a full flavoured soft-boiled egg, dried seaweed, bamboo shoots and spinach. 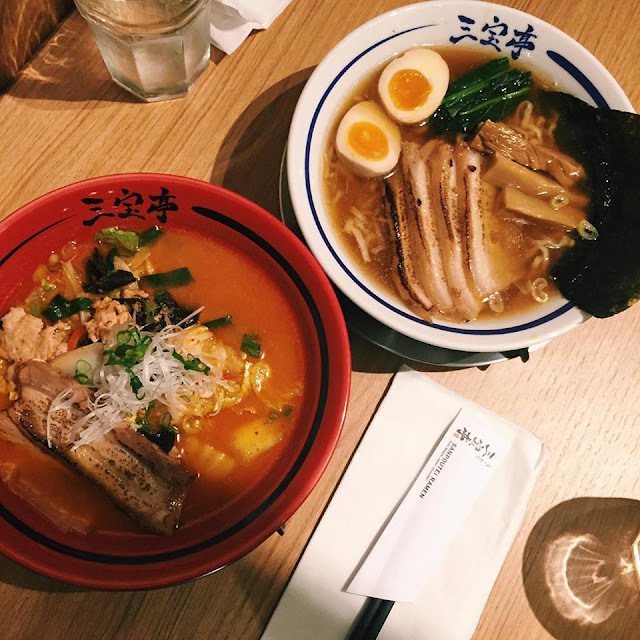 I tried the broth and it is definitely very different from your typical pork bone broth. It had a strong fish stock and they mention in their menu that this is from the dried sardines they use. We both agreed that we loved the aburi chashu very much though. It has a very nice char and the ratio of meat to fat is perfect with the fat melting in your mouth. Soft-boiled eggs were pretty good but Marumata’s is still the best. 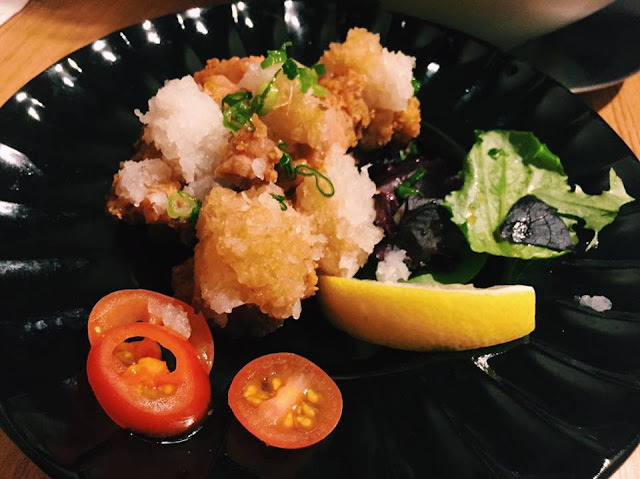 We also got one of their appetizers which were the Deep Fried Spring Chicken with Oroshi Ponzu Sauce. No gyozas here but three choices of fried chicken. The fried chicken itself was very crispy and well made, but the ponzu flavour wasn’t very apparent. For $6, this only came with 4 pieces, so it was pretty pricey. 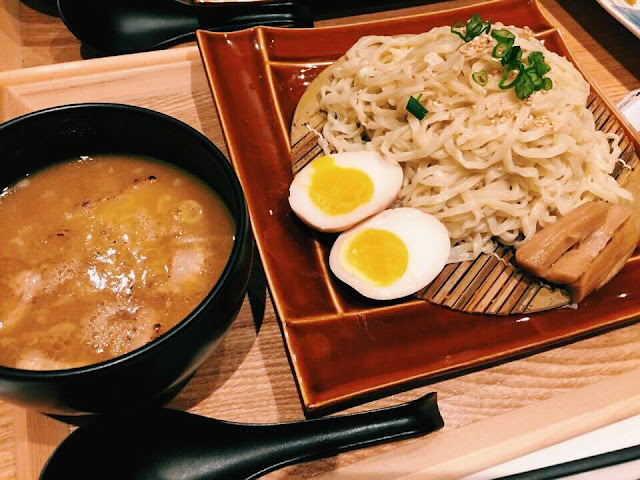 On another occasion, K visited Sanpoutei and tried the Tsukemen which she raved, so I might as well include it here. For $12.50, this comes with a flavourful broth of dried sardines and bonito and a side of cold noodles which you dip into the hot broth. It also comes with a full flavoured soft-boiled egg and bamboo shoots. With this menu item, you get 30% more noodles, so perfect for bigger eaters. You also get a jug of wari soup, which is a plain soup stock. Your pour this into the dried sardine soup to finish your noodles. 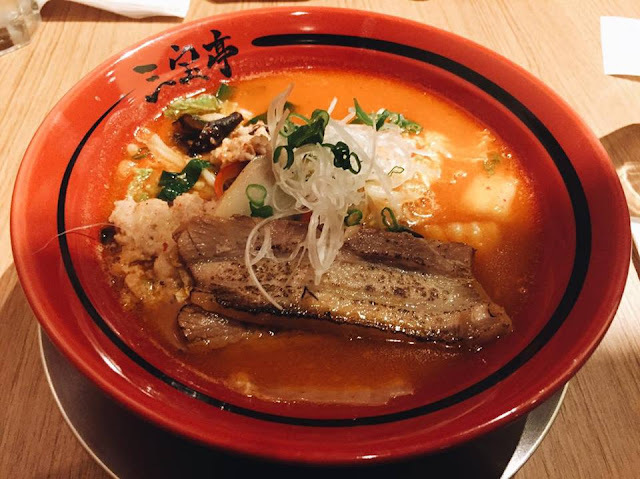 Overall, I was quite pleased that there is a new addition to ramen choices in Richmond. The style of ramen is quite different so a nice change. However, ramen is on the pricier side starting at around $12 a bowl. Friendly service and nice ambiance.